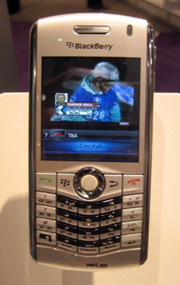 This weekend MobiTV released their mobile TV application for the Blackberry 8130. The software itself is not device specific, but it does require the streaming codecs found in OS 4.3. Clarity and speed are reported to be great... and the application has a handy program guide. You can download the application OTA with a 30-day free trial if you have an 8130. Simply go to mobile.blackberry.com on your Berry. What about subscription costs, limitations and updates? Discuss and ask questions about MobiTV here in our forums.